Improving the quality of life and health outcomes for patients with advanced kidney disease through increased access to living donor transplants. Transplantation is the best therapy for most patients with end stage kidney disease because it provides the best quality of life and helps people live longer compared to dialysis. A successful kidney transplant can as much as triple a patient's life expectancy. The focus of Transplant First - a joint initiative between the BC Renal Agency's Kidney Care Centre (KCC) Committee and BC Transplant - is to promote pre-emptive transplants (transplants provided to patients before they start dialysis) through living donation. The initiative focuses on working with staff and patients at the 14 Kidney Care Clinics (KCCs) across BC to inform them of the advantages and safety of living donation and give tools to assist in finding willing donors. There is a number of resources and materials available for staff to support their patients interested in living donor transplantation. 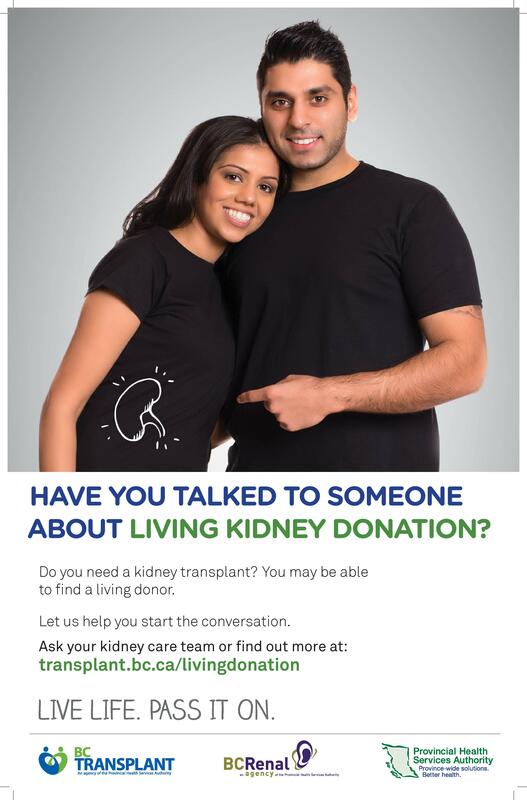 This document provides helpful strategies to talk about kidney donation and donor outreach with patients who are potential candidates for a transplant. These posters inform patients about the resource‎s available to them to learn more about living kidney donation. They can be downloaded and printed to post in KCC waiting rooms. ‎This presentation reviews the benefits of a pre-emptive living donor kidney transplant and some tools and strategies you can use when approaching this subject with your patients. This video is from BC Transplant's Education Day (May 23, 2017), with a role play that includes tips on how to help a patient through the living donor outreach process. There is also a provincial coordinator supporting the KCCs with the Transplant First initiative. The coordinator can be reached at carolyn.jarvis@vch.ca.